A full days activity or can be combined with a half day caving . The activity is suitable for all ages and abilities and will be geared to suit your group. Fantastic group activity involving rock scrambling and traversing, river crossings, jumping of waterfalls and much more. Kitted out in wetsuits, buoancy aids and helmets, you will follow a river upstream through a gorge working as a team and helping each other overcome the many obstacles in your path. 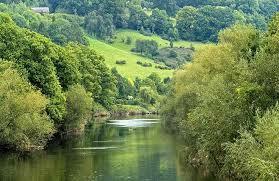 A half day activity on the River Wye. Great for fun and teamwork. Using poles, rope and barrels you will be given a time limit to construct a raft you hope will carry your team on the river. Should this first attempt prove unsuccessful you will have a second chance with help and advise available if you need it, then onto the river for fun and games. Available as a half, full or multi day activity these canoes are suitable for up to 3 people and are for hire or with an instructor. A similar set up to kayaking with instruction and river trip. Ideally we would have 2 people in each canoe but instruction can be given for solo paddling if required. With both canoeing and kayaking you will have a qualified instructor with you at all times. The number of instructors depending on size of group.